Most Alaskans had reason to complain about the recently departed summer. Not that having a reason has kept anyone from complaining in the past. 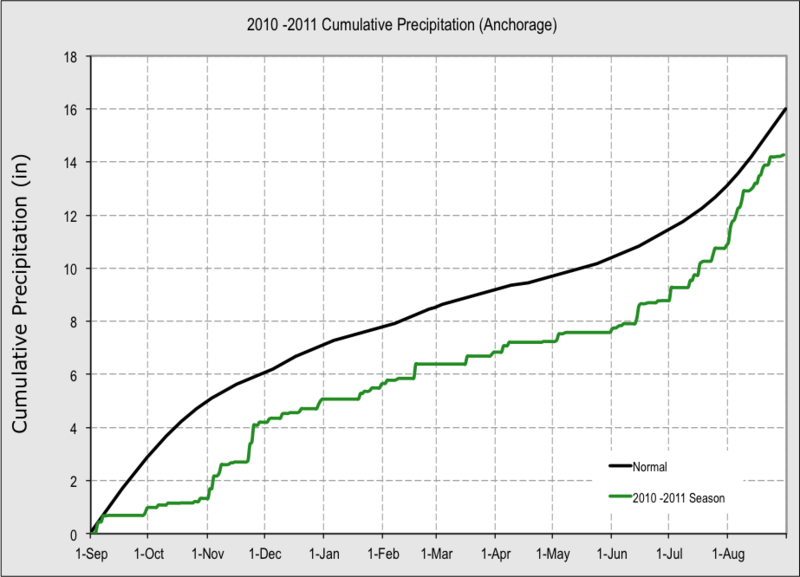 I invite you to check out the hard data below, compare it with your experience and let’s see if we can come up with an award (sorry no prize money) for the worst 2011 summer in Alaska. I’d like to hear your experience and opinion on this high level competition. To rate the summer weather we first need to define “summer.” Back on the summer solstice I talked about how that date is only an astronomical event, not one that really marks the start of summer, since most of the best Alaskan summer days are history by June 21 and many of them by June 1st (see the article). And when does summer end in Alaska? There are many markers that could be reasonably argued for the end of summer, and certainly it does not have to end at the same time across this vast land. The fall equinox (which happens to be today) does work pretty well for most of the state, but for the sake of symmetry I’m using May 15-Sep 15. The red trace is the high temperature of each day of the summer. The jagged spikes and valleys are variations in the high temperature from day to day, not from a daily high to a nighttime low as in graphs in other articles. (For why I’m using high temperature, and not average of high and low, see the this post.) The smooth black curve is the daily “normal” or climatological average, computed over the past 30 years (these are the brand new NCDC 1981-2010 normals, by the way). Barrow is the coldest city in the USA but keep in mind the contest rules say that it’s a city’s summer weather with respect to their average that counts, otherwise Barrow would be a shoe-in. This summer, the Top of the World’s highs were overall 1.6°F above average, the relatively warmest of the bunch. 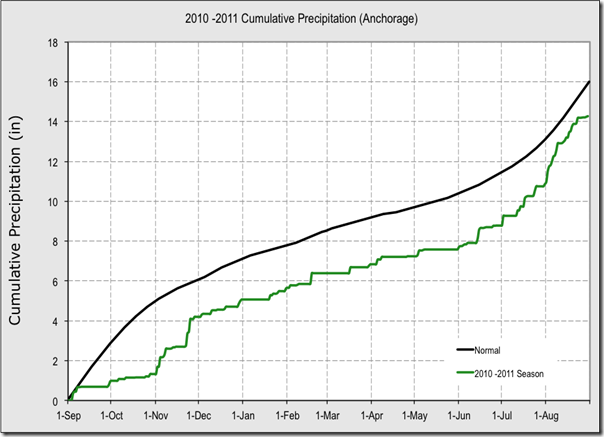 For precipitation, I’ve borrowed graphs from UAF’s Alaska Climate Research Center. (Yes, I did the temperature graphs…using the free spreadsheet Gnumeric and the free vector graphics software Inkscape.) 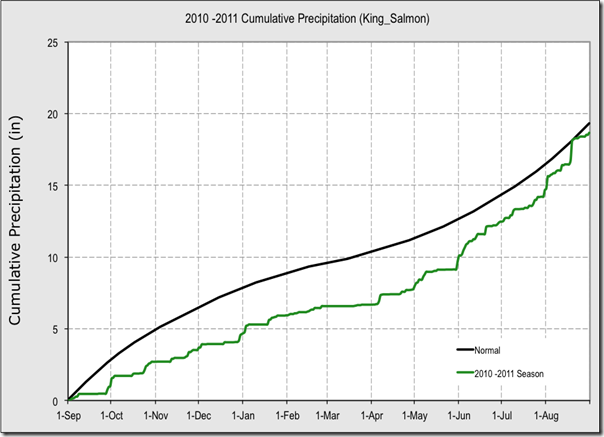 The precip graphs don’t cover the same time period, so check the dates along the bottom. Also note that the scale of accumulated precipitation along the left side is scaled according to the station’s average annual amount, so Barrow’s goes up to 6 inches while Juneau’s goes to 70. But again we’re comparing this year with the average, so its fine this way. What you want to focus on is the slope of the green line compared to the black. That will tell you the rate of accumulation, i.e., how much rain came at certain times compared to the climate. 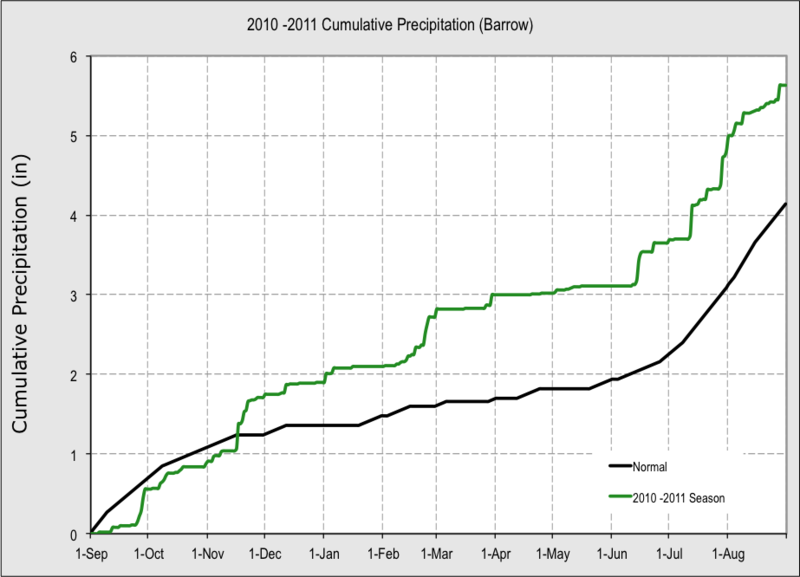 Barrow started the summer with a large surplus built up the previous November and February. During the summer, next to nothing came down until mid-June, but then not at anything much more than average. 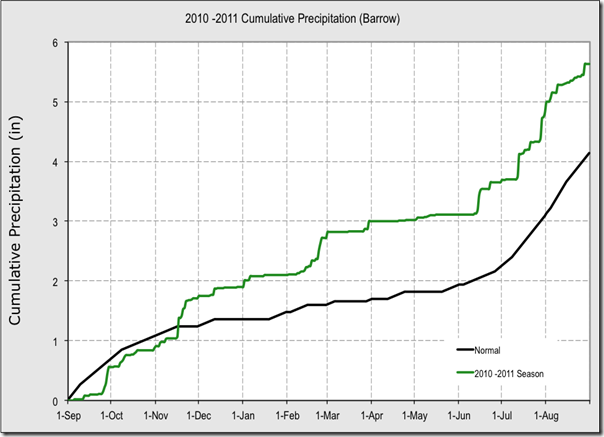 I’d say Barrow’s summer was a little better than usual given the temperature trace. Moving south to the next contestant, Nome. Nome’s a tough competitor when it comes to lousy weather. I should know, I cut my meteorological teeth there as an intern with the NWS. But the Gold Rush City was slow out of the gate this summer. Temperatures started a bit above average on May 15th and warmed nicely, spiking to a new record high of 71°F on the 27th, then to 75°F on the 28th (only tying the record). The 28th was Saturday, so it was an amazing start to the 3-day Memorial Day weekend. But it was all part of a brutal psychological strategy: the high on Sunday the 29th only made it to 47°F, and on Memorial Day only to 41°F!. The judges will surely reward this bait and switch. After that, only a single day made it to 70°F and highs were mostly below normal. In another holiday smack down, Independence Day started with a light frost and only managed 45°F for a high. Labor Day had mild temperatures, but winds gusting to 43 mph. Surprisingly, highs were only 0.2°F below average for the summer period. 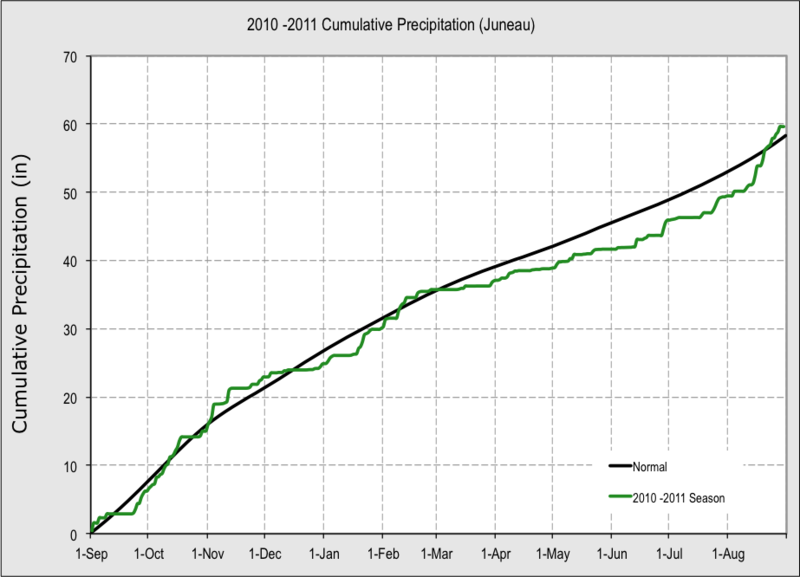 On the precipitation side, Nome was about average in May and June, then took off in July and August. 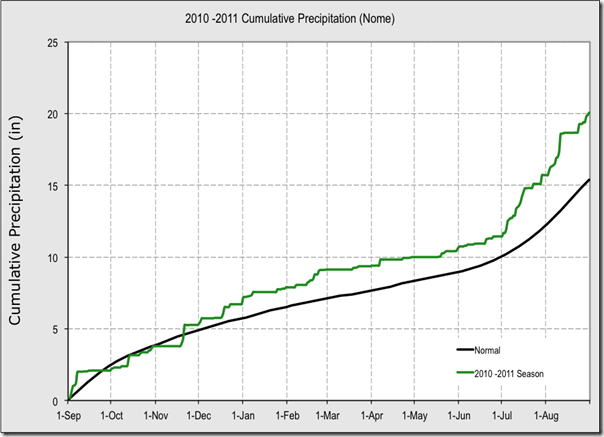 The July total was twice the normal amount and August 135%. Strong storms hit the town with regularity during this period. 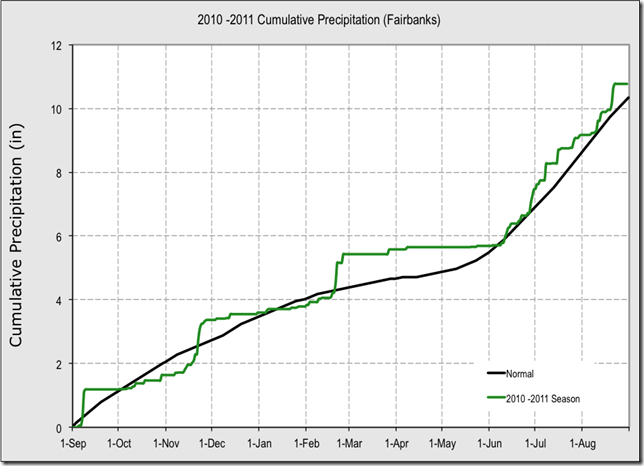 With a summer deviation of 1.4 degrees F above normal Fairbanks’ temperatures are not going to win this contest. Besides the Memorial Day heat shared by many areas, there was a high of 88°F on 25 June coinciding with around 4,300 lightning strikes in the interior, which started 10 new wildfires. Otherwise, there were not a lot of extreme temperatures for the Golden Heart City. A string of nice, warm days in late August and early September made up for some of the cloudy cool weather earlier, further eroding Fairbanks’ chances at the lousy summer prize. 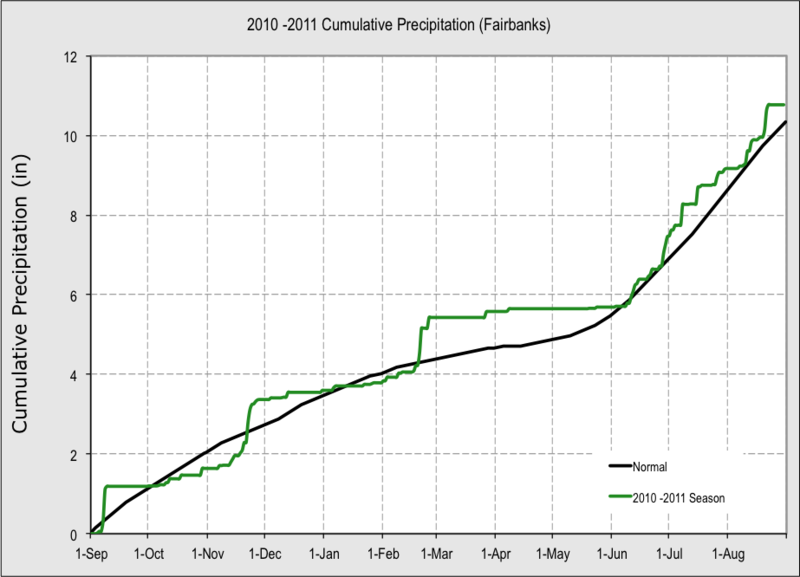 Similar to much of the state, Fairbanks and the interior were quite dry for the the first part of the summer, then went into catch-up mode in June. Look at the long flat section on the precipitation graph: very little moisture from late February till into June, then a steep climb. The high river levels that resulted washed out both the Taylor and Steese highways in June and flooded the Salcha River in July. The active wildfire season during the dry season was cut short when the rain came and in the end the acreage burned was only 1/3 of average. Events like that boost the interior’s position in the worst summer race, but will it overcome the poor temperature performance? Alaska’s big city had a pretty unremarkable summer. If residents think they had a bad one, I’ve got news…you live on the ocean and cloudy and cool are to be expected. Some of the warmer summers of recent years have spoiled you. OK, it was a little cooler than normal with summer, as we defined it, 0.8 F below average, and only 7 days reached 70 F. (This is at the airport—it’s a usually a few degrees warmer on the east side of the city). Precipitation was a little low for the early summer but not as dry as the interior or as parts of Southeast even. 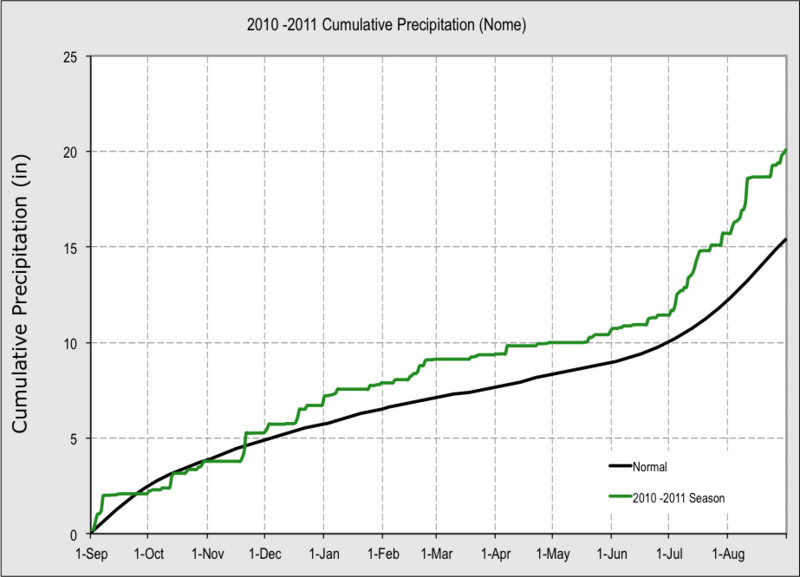 In fact even in June there were 20 out of 30 days with at least a trace of rain, but amounts were small. July was better in that there were 16 dry days but August had only 4 dry days. Not a great summer, but not exactly medal material either. Lets move southwest. Cold Bay is very maritime, so we don’t expect much in the way of temperature swings, and that was the case, as you can see on the graph. If the ocean water is cooler than usual, the temperature will follow suit. Over the summer the average max temperature for Cold Bay was right about 1°F colder than average. If it wasn’t for a few warm days scattered here and there, especially the two spikes in mid August, the average would have been quite a bit colder. Being so maritime in climate, Cold Bay is also slower to warm on average, so the traces of snow on May 8 and 15 were not that unusual. No, I did not mistakenly put in the wrong graph here. There was none for Cold Bay, and King Salmon was the closest available. That’s what happens when you borrow your graphs. (The total in the chart at the end of the post is for Cold Bay). Cold Bay and King Salmon bucked the pattern of most of the rest of the state and did not have a very dry first half to the summer. In fact both were relatively wetter in the earlier months. In short, a wet and cool summer for the region. But is it enough to win? Juneau’s average summer highs are surprisingly close to Anchorage’s (comparing airport to airport), but this year instead of 0.8°F colder than average like Anchorage, the Capital City was 1.8°F colder. Juneau did have 10 days of 70°F or warmer compared to Anchorage’s 7, a volatility evident looking at the respective graphs. From mid July through the first few days of September highs were well below average every day but a precious few that barely broke the black line. The raw numbers definitely favor Juneau as the cold summer leader. Juneau, and Southeast Alaska in general, followed the trend of most of Alaska with a dry first half of the summer. In fact the pattern was more pronounced here than most areas, and north of Juneau, in Haines and Skagway, it was yet more dramatic. See the details here. 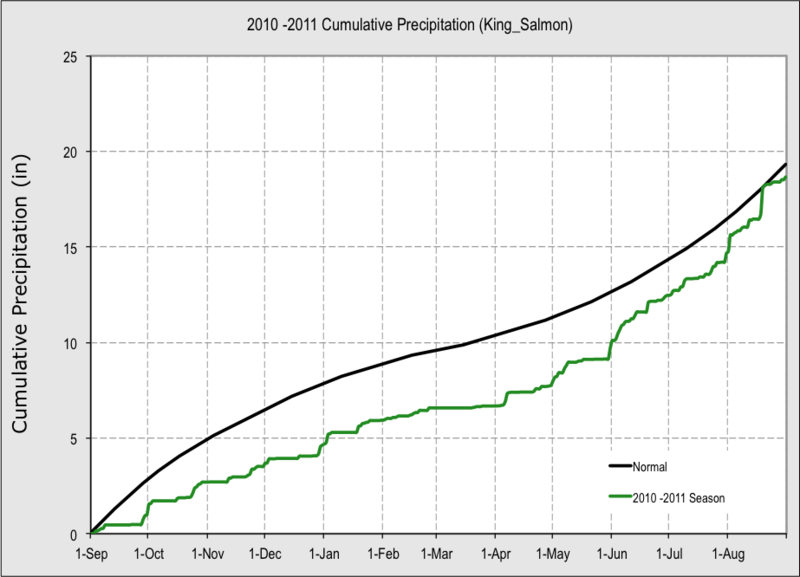 Meanwhile, in the southern panhandle, Ketchikan was running at around 200% of average for July and August, including an impressive 3.69 inch dowsing on July 1, right in the heart of the “dry season.” A couple record events in August brought even more rain to the southern half of the panhandle the wettest one day total being 5.42 inches at precipitation powerhouse Port Alexander on August 20, smashing the 1958 record of 3.15. Here’s a summary table for the six cities reviewed. Remember it is the deviation from average that makes or breaks the case for worst summer weather. Who do you think deserves to win? I think Juneau should get the worst summer award, to be shared with all points south in the panhandle. Nome comes in a strong second and Cold Bay and the southwest coast deserve an honorable mention. They rest of you are just being wimps or complainers. Admittedly I’ve only looked closely at six stations, so some deserving folks might have gone unnoticed. Therefore I’d love to hear your take on the contest (with evidence), and any input or ideas via the comments link below, as well as donations of blankets and umbrellas for prizes. And yes, I’m gearing up for a shot at the winter 2011-12 forecast. Stay tuned.